Curiously a Holden design for Hounslow East did exist and was even approved for construction by Frank Pick but for some reason it never got built. Instead the original 1909 Edwardian ticket hall remained here until 2002 when this gaudy monstrosity was built by Acanthus Lawrence and Wrightson Architects. 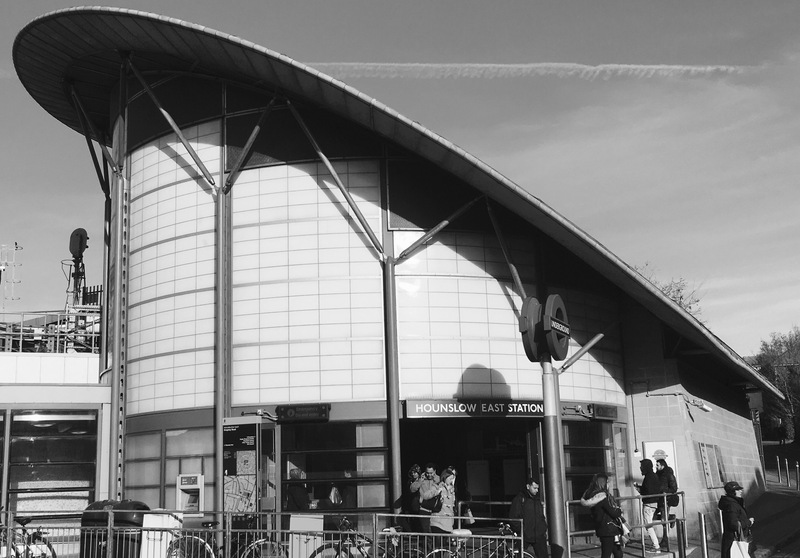 I’m not sure whether the use of black and white images for this project is making Hounslow East look worse than it actually is. Or alternatively whether it’s actually saving you from true horror of the copper green roof, dirty cream tiles and diagonal wooden beams. Yes, you did read that right, those V-shaped beams are made of oak – which I suppose at the very least is interesting and unusual for this period of design. I suppose it’s supposed to look like a tree? Naturally it doesn’t. This is dreadful. The redeeming feature of this station is the interior ceiling which again is a surprising series of oak beams which wouldn’t look out of place in a high class theatre or concert venue.